The Park Motel is situated in the River District of Downtown Wisconsin Dells. 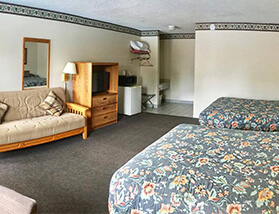 Staying at The Park Motel is a terrific way to experience the long-time tradition of the Wisconsin Dells at an affordable price for any family. As an added bonus, guests at the Park Motel will receive 4 waterpark passes to over 500,000 sq. ft of indoor and outdoor waterparks at the nearby Wilderness Resort. All the exciting attractions and shopping in the Dells River District are Just minutes away. Experience the exciting uniqueness of downtown Wisconsin Dells with shops, attractions, museums, pubs, restaurants, boat tours, and River Walk. We have a clean and refreshing heated outdoor pool with a great view of nearby Bowman Park. 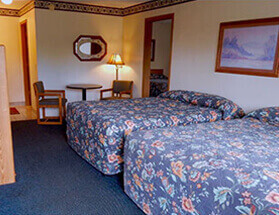 Enjoy our well appointed rooms and friendly staff! 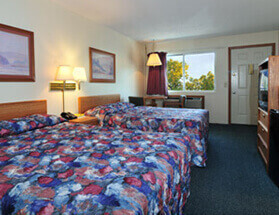 Standard rooms, deluxe rooms, and suites are available. Come and experience what we have to offer! We are open year round.